In stock 63 pcs. Also available in our walk-in store. A small and lightweight sleeping bag for summer use. We occasionally get these without compression sacks, so here you go for a cheap price! 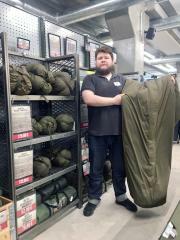 The British army uses generally two sleeping bags: the larger PLCE sleeping bag and this smaller Jungle sleeping bag. 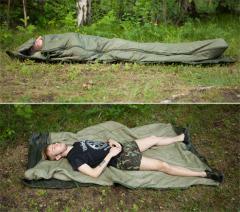 These sleeping bags were designed to be used in warm climates, so it's perfect for summer use, here in Finland at least. 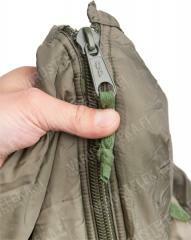 This bag opens all the way with a zipper, thus doubling as a blanket. The outer material is 100% polyester, and same stuff in is used on the filling too. Thanks to being all-synthetic the bag doesn't absorb sweat too much and if wet, it dries really quickly. Surprisingly this sleeping bag doesn't "electrify" your hair as much as many others we have seen and used. Measurements: approx. 186 x 70 cm, weight: 1,4 kg. Bags are used and perfectly usable. Some have colour blemishes due to long exposure to the sun.